The Christmas Holiday Season is so busy & “full on” – can be a bit daunting with food, drink and celebration overload. 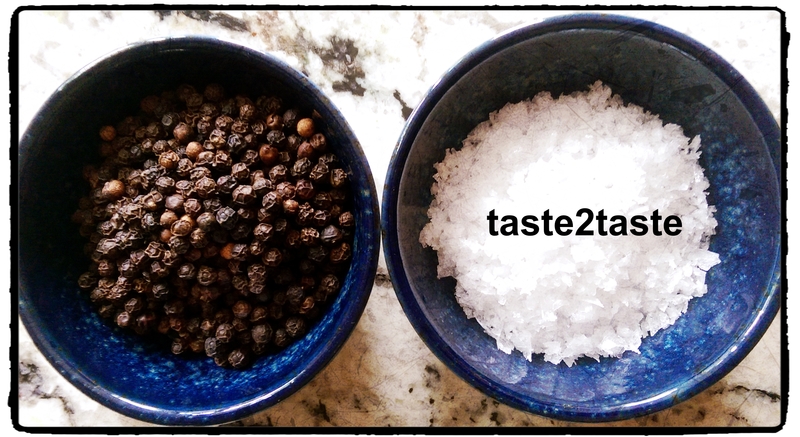 When we created our taste2taste.com blog Simon & I decided we wanted to focus on local makers & suppliers. As the interest in craft beer continues to grow it provides great inspiration to discover, find out more, taste & write about it. In New York, we are big fans of @deciccosbeer in Westchester County that have a phenomenal range – thanks to Brendon O’ Brien for all your expert advice helping us pair beers & hard ciders for Thanksgiving & July 4 holiday festivities (see 3 previous posts). Over in London, we now have Jason, Lee & the team @BeerAsylumPinner, in my home village. With over 350 bottled beers, rotating draughts of 4 that change weekly to enjoy in-store, or growlers to take away, there is a great range from both UK & Worldwide not easily found in London. Lee picked out some great beers for me to pair with food so I shall be sharing these recipes over the next few weeks. Here is pick #1. 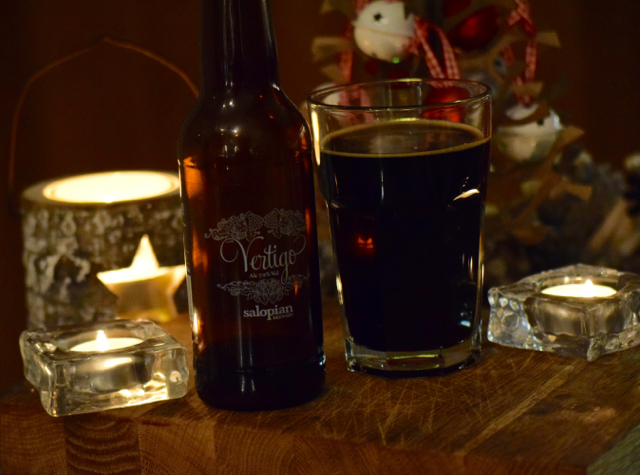 Vertigo beer (7.2% abv) from @SalopianBrewery in Hadnall, Shropshire is a dark, full bodied yet very smooth aromatic beer with a lovely malty, rounded taste- slightly chocolatey in characteristic. 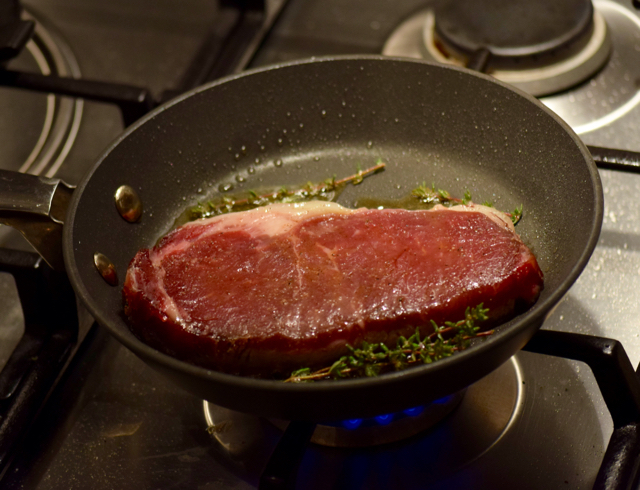 I decided to keep it simple & pair it with a seared Sirloin steak for a meal that is quick to prepare – just the thing if you are rushing out & about. 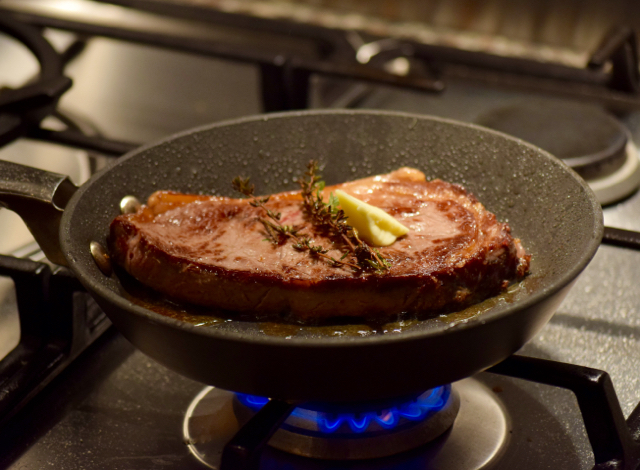 Cook for a few minutes each side until a good caramelised colour – I like my steak medium rare (3-4 mins). Season with salt and add a knob of butter/dairy free spread to baste which gives a great flavour & colour. Very important to remove the steak from the pan & rest for 5-6 minutes for maximum taste & flavour, and so you don’t get the steak juices bleeding onto the plate. I serve my seared steak with some Dijon mustard, steamed spinach & broccoli and roasted cauliflower – but would work well with sweet potato fries! Vertigo beer could also be paired with Simon’s Sweet N’ Sour Beef & Squash Stew. It would also work with dessert: a mince pie or even a choc chip cookie would work with its chocolatey, malty notes and smooth finish. 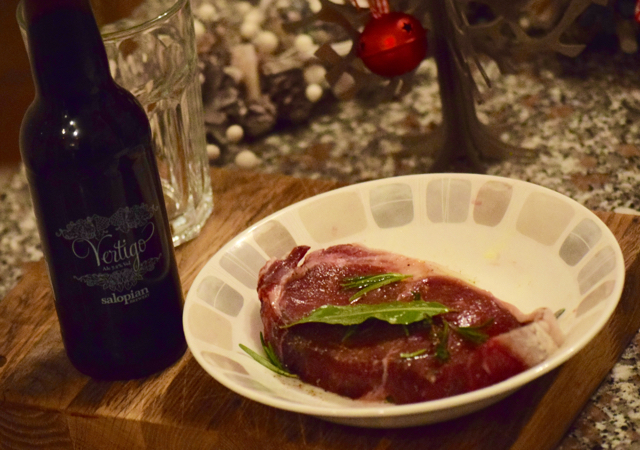 Vertigo beer and seared steak – a great match!